Kolahoi Glacier trek is a classic Kashmir trek which takes us through the lush green valleys, with shady forested slopes fed by the gushing streams, up into a landscape of alpine meadows and breath-taking panoramic views of the Himalayas all around. Moving along at an easy pace makes this a perfect soft adventure for inexperienced walkers and families with children. Caravan of pack ponies with camping equipment, sleeping gear and food supplies with experience trekking support staff of mountain guide, cook and helpers along with riding horses makes this an unforgettable holiday experience. Welcome aboard our flight to Delhi, enjoy onboard hospitality. Indulge yourself with delicious Indian and Continental cuisine. Arrival in Delhi, airport meet and transfer to Hotel Park. Fly to Srinagar, our base-camp for Himalayan wonders. Arrive Srinagar and transfer to the houseboat on a pristine lake. Surrounded by Himalayas. After a traditional welcome tea and biscuits, you will board small boats which resemble Italian Gondolas with canopies and spring seats to ride around lakes. Float through a network of canals. Breakfast at your houseboat, followed by a leisurely visit of enchanted Mogul gardens of Nishat 'garden of bliss' situated on the banks of the Dal Lake, with the commands a magnificent view of the lake and the snowcapped Pir Panjal mountain range which stands far away to the west of the valley. It was built by Mogul Emperor Jahangir, who was the father of the builder of Taj Mahal. Afterwards visit Shalimar" the garden of pleasure built by Emperor Jahangir for his wife Nur Jehan, is a beautiful garden with sweeping vistas, lakes, and shallow terraces. The garden has four terraces, rising one above the other. A canal lined with polished marble and supplied with water from Harwan runs through the middle of the garden. The fourth terrace, by far the best, was once reserved for royal ladies. AWANTI PURA. Starting from Pahalgam: a shepherd's village with breathtaking views, is Kashmir's premier resort, deliciously cool even in the height of summer, our caravan is headed towards Aru, Situated 7300ft. up at the confluence of the streams flowing from Sheshnag Lake and the Lidder River. We trek steadily along the river to the pretty log-hut village of Aru, 7.5 miles from Pahalgam. At Aru, the camp is already set up for you beside the Lidder River. Tonight dine around a bonfire. After a hearty breakfast we continue our trek in the company of Gujjar Caravans 7.5miles through the lush Lidder Valley to Lidder Watt 10500ft; where our reward is overnight at the beautiful Lidder Watt campsite, situated by a stream that runs straight from the glacier. A short trek takes us to the base of the Kolahoi Glacier at the head of the Lidder Valley. The glacier, climbing from 1120ft. up to 13000ft. descending from twin peaks at 17400ft.that tower majestically overhead, a truly magnificent sight. Return back to Lidder Watt base camp for meals and rest. After breakfast we descend back to Pahalgam. After lunch drive to Srinagar, and transfer to your houseboat on the lake. Breakfast at your houseboat. Our visit to old city starts at The Jama Masjid at Nowhatta, an important mosque in Srinagar at which thousands of people congregate for the Friday prayers. Of imposing proportions, the mosque is built around a courtyard and is supported by 370 wooden pillars. The hushed quiet of the mosque counterpoints the bustle of the old bazaars surrounding it. Originally built by Sultan Sikandar in 1400 AD, and enlarged by his son, Zain-ul- Abidin, it is a typical example of Indo-Saracenic architecture. Khanqah of Shah Hamadan: Situated on the banks of the river Jhelum, between the third and fourth bridge, it is the first mosque ever built in Srinagar. Chhatti Padshahi Gurudwara: The sixth Sikh guru travelled through Kashmir, stopping to preach occasionally. A gurudwara has been built at the exact site of each of these halts. The most important one among these is Chhatti Padshahi gurudwara, situated near Rainawari. Also experience the walnut woodcarving and papier machie making demonstration brought here by Persian artisans in the 16th. Century. Evening at leisure. Break at your houseboat. Fly to Delhi and drive to Agra, home of world famous Taj Mahal, Overnight Hotel Mansigh Palace. At sunrise visit Taj Mahal, the most extravagant monument ever built for love. On the death of his beloved wife Mumtaz Mahal, Mogul Emperor Shah Jehan built her this memorial over which 20,000 men labored for 22 years to create a masterpiece in white marble inlaid with semi-precious stones; the art is called pietra dura. This mesmerizing monument of love will leave you speechless. After breakfast, Agra Fort where Shah Jehan spent the last years of his life, imprisoned by his son Aurangzeb. The most impressive part of the Fort are the Dewan-e-Am, Hall of Public Audience and the Dewan-e-Khas Hall of Private Audience where he received foreign dignitaries. Afterwards drive to Jaipur. Visit Fatehpur Sikri, an epic poem in red sandstone, it was built by Emperor Akbar in 1569 and deserted 14 years later due to lack of water. Legend has it that Akbar who was without a male heir, made a pilgrimage to this spot to visit the saint Sheikh Salim Chisti The saint predicted the birth of a male heir and in gratitude, after his son Jehangir was born, he built Fatehpur Sikri to commemorate the birth. The Diwan-e- Khas, Hall of Private Audiences has a unique interior design. The Diwan-e-Am or Hall of Public Audience is an open courtyard surrounded by cloisters and adjoining it is the Pachisi courtyard arranged like a gigantic game board, where the Emperor played chess using slave girls as pawns. Visit Akbara mosque with famous Victory Gate and Salim Chisti Tomb. Arrive jaipur and check in at Hotel Mansingh Palace. This evening at leisure. 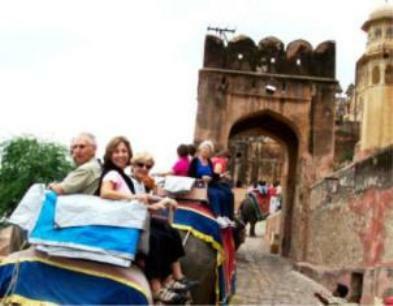 After breakfast, departure to Amber in the Aravalli hills, we'll travel in the Maharajah style aboard decorated elephants to the Amber Palace. Sightseeing includes sensual Sheesh Mahal, Marble palace and Vijay Temple, which are marvelous examples of Rajput architecture. This afternoon free for Stroll around Jaipur bazaars. Breakfast at your hotel. Drive to Delhi. Sightseeing in Old Delhi takes us through Chandni Chowk, the bustling bazaar, Jama Masjid, the oldest and largest Mosque in India, Mahatma Gandhi's memorial and return via Connaught Circus. Hotel Park. Breakfast at the hotel. Sightseeing of New Delhi includes Jantar Mantar, Birla Temple, Qutab Minar Tower, India Gate and Raj Path. Time free for last minute shopping etc. Evening transfer to airport. Fly to New York and connect with other cities.